A hall at the Hōryū-ji Buddhist temple, built by Empress Suiko and her regent, Prince Shotoku. Empress Suiko (推古天皇 Suiko Tennō) (554 C.E. – April 15, 628 C.E.) was the thirty-third emperor of Japan, according to the traditional order of succession, and the first known woman to hold this position. She ruled for 35 years. She encouraged the influence of Chinese culture and Buddhism by protecting Buddhism and promoting the study of astronomy and geography when books on these subjects reached Japan from Korea. Suiko also enforced diplomatic relations with China by sending official diplomatic delegations to China during the Sui dynasty. She developed the rules of court etiquette, for example, by the use of caps to distinguish rank. Suiko, together with Soga Umako and Shotoku Taishi ("Prince Shotoku"), initiated reforms of the Japanese bureaucracy and they appear to have introduced a Constitution, the Seventeen Article Constitution of 604. In Empress Suiko's efforts to centralize the state, this constitution set the moral tone of her reforms according to the central virtue of Japanese cultural tradition, harmony (和 wa). It outlined the conduct that was expected of civil servants in the running of the country under the supreme authority of the Emperor. In a time and place in history where women did not hold significant public positions, Suiko was remarkably able to retain her authority for 35 years. The Empress was concerned with good governance and the promotion of a value based social system during an age in which many rulers were only interested in protecting their power and accumulating wealth. The future Empress was known by several names, including Princess Nukatabe and (possibly posthumous) Toyomike Kashikiya. She was the third daughter of Emperor Kimmei, and her mother was Soga no Iname's daughter, Soga no Kitashihime. She was a consort to her half-brother Emperor Bidatsu, but after Bidatsu's first wife died she became his official wife and was given the title Ōkisaki (official wife of the emperor). She bore two sons and three daughters. After Bidatsu's death, Suiko's brother, Emperor Yōmei, came to power for a brief period of about two years before dying of illness. Following Yōmei's death, a power struggle developed between the Soga clan and the Mononobe clan, with the Sogas supporting Prince Hatsusebe and the Mononobes supporting Prince Anahobe. The Sogas prevailed and Prince Hatsusebe acceded to the throne as Emperor Sushun in 587. However, Soga no Umako quickly began to fear Sushun's growing resentment of the power of the Soga clan and Umako had him assassinated in 592. When asked to accede to the throne to fill the power vacuum that then developed, Suiko became the first of several examples in Japanese history where a woman was chosen to accede to the throne to avert a power struggle. Prince Shōtoku, Yomei's second son, was appointed regent the following year. Political power during Suiko's long reign is widely viewed as having been wielded by Prince Shōtoku and Soga no Umako but Suiko was far from powerless. For example, her refusal to grant Soga no Umako's request that he be granted the imperial territory known as Kazuraki no Agata in 624 is widely cited as evidence of her independence from his influence. Some of the many achievements under Empress Suiko's reign include the official recognition of Buddhism by the issuance of the Flourishing Three Treasures Edict in 594, the opening of relations with China's Sui court in 600, the adoption of the Twelve Level Cap and Rank System of court etiquette in 603 and the adoption of the Seventeen-article constitution in 604. While it is speculated that the Constitution may have been posthumously attributed to the Empress and her regent, it sets out ideas and reforms that were initiated by them, including state patronage of Buddhism. Three key leaders—Empress Suiko, Soga Iruka, and Shotoku Taishi—supported Buddhism. 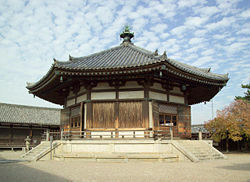 Under her reign, a unique Buddhist culture flourished and a number of temples including Horyuji—the oldest existing wooden building in the world—were built. The Empress actively employed Korean Buddhist monks and scholars, who were also familiar with Chinese culture, and created a unique international culture (Asuka culture) based upon Japan's traditional cultural heritage. The two oldest volcanoes in the Hawaiian-Emperor seamount chain are named for Suiko. They are approximately 65 million years old. During Empress Suiko's reign, art, education, and culture flourished in Japan. She ordered the construction of copper images of the Buddha During Empress Suiko's reign, the island nation of Japan was open to cultural and religious influence from the continental civilizations of China and Korea. These influences were valued, and incoroprated into the Constitution of 604. Later, Japan would despise the Chinese and Koreans and regard themselves as superior to them but at this period their was recognition that Japan, China, and Korea belonged to a common cultural world. Lewis credits the Empress with furthering Korean influence in art and culture. ↑ April 15, 628 C.E. corresponds to the Seventh Day of the Third Month of 628 C.E. (Boshi) of the traditional lunisolar calendar used in Japan until 1873. ↑ "The Formation of the Hawaiian Islands." Hawaii Center for Volcanology. The Formation of the Hawaiian Islands Retrieved September 25, 2007. ↑ Lewis, Jone Johnson. “Suiko – Empress Suiko of Japan.” About Women’s History. Empress Suiko - Suiko of Japan Retrieved September 25, 2007. Empress Suiko of Japan ThoughtCo. Empress Suiko Encyclopedia of World Biography. This page was last modified on 6 September 2017, at 16:36.